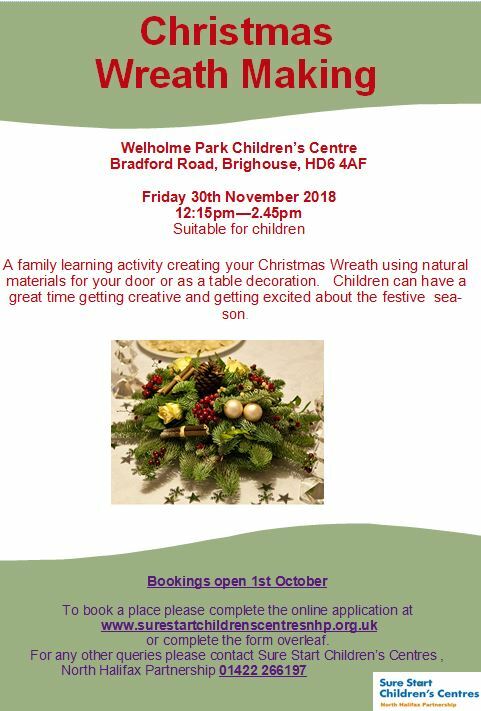 Wellholme Park Children’s Centre, Bradford Road, Brighouse HD6 4AF is holding two events at the Children’s Centre giving you the chance to make your own Christmas Wreaths. A family learning activity creating your Christmas Wreath using natural materials for use on your door or as a table decoration. Children can have a great time getting creative and getting excited about the festive season. The first event is Monday 26 November, 10:30am-1:00pm. The second is on Friday 30 November, 12:15pm-2:45pm. Bookings are open now so please book your place online on the website or by calling 01422 266197. Don’t miss out on all the fun! This entry was posted in Brighouse, Events, Nov, Young People and tagged NHP Sure Start Children's Centres, Wellholme Park Children's Centre.